Before I dive into how you can boost and protect your immune system and that super yummy four sigmatic hot cocoa it is so important that I stress this isn’t a quick fix issue. You can’t just pop unlimited amounts of vitamin C when you get a cold to help you. Why? Well this isn’t addressing the root cause of the issue which is something that I as a holistic nutritionist am passionate about. You can’t fix your immune system without addressing your diet, lifestyle and other areas of your life and perhaps if you are really struggling in these areas, you seek out the help of a qualified professional (like me!). When you strengthen and boost your immune system, you are making the choice between battling a cold or flu for a week or a few days. If you don’t want to be sick in bed for a week, then its a good idea to work from within rather than pop over the counter drugs or antibiotics that don’t address the real issue. Whats the deal with antibiotics? The persistent and overuse of antibiotics has led to the evolution of new drug-resistant strains of bacteria and this leads to even more antibiotics. This also wreaks havoc on our gut as it destroys EVERYTHING in it, the good bacteria and the bad. Even more crazy is that about 70-80% of our immune system lies in our gut, so when we destroy the good bacteria, what does that do to our immune system? You can bet that it sure doesn’t help the good bacteria do its job of fighting off that cold or flu and even more serious diseases. So this isn’t just about boosting your immune system so you can fight off a cold or a flu, this is about creating a healthier environment to fight off even more serious diseases. What can you do to help boost your immunity then? Reduce stress and incorporate the right type of exercises: Stress is linked to all kinds of diseases and when we live in a constant state of stress, our immune system is compromised without a doubt. This may be because corticosteroids (substances that are produced by the adrenal glands as a response to stress) suppress the immune system. Numerous studies have found that low psychological states such as stress, depression and grief depress the immune system. Therefore learning how to cope with stress is a great way to help boost your immune system. Things like meditation can help to increase your T-cell count which is one of the body’s types of immune cells. Including other types of calming exercises like t’ai chi has also been found to boost your T-cell count. So if you want to really boost your immune system, include more relaxing forms of exercise instead of only high impact exercises that can actually stress out your immune system even more. Self care is also an absolute must! My four sigmatic hot cocoa is a great way to unwind, or sip on my personal fave- reishi before bed! Take care of your gut: I have indicated about the importance of your gut above and spoken about this in a previous post as well. Your gut health is so important on so many levels and if it isn’t functioning optimally, health problems will arise without a doubt. The immune systems main goal is to identify the body’s enemies (bacteria and viruses) and destroy them and the main gates into the body are through the digestive tract which lets in food and the lungs. Within the digestive tract is the immune system and the main goal is to allow completely digested food particles to pass through the gut and into the body. Now, incompletely digested food can result in an immune reaction and allergies, because of these large food particles passing into the bloodstream. So when you come into contact with various infectious agents how your body reacts is determined in large part by the balance of good to bad bacteria in your gut. This is because the beneficial bacteria consumes the nutrients that would otherwise feed the bad guys and they also block the receptor sites that harmful bacteria have to latch on to in order to cause an infection. Taking a good quality probiotic helps to protect you as they produce substances such as lactic acid and hydrogen peroxide which stops harmful bacteria from growing. This is natures antibiotic making it very hard for bugs to survive and they positively boost your immune system. Increase your vitamin C intake: This is probably the most widely understood way to boost your immune system and for good reason. However it is important to note what kind of vitamin C to take and why this is so crucial to building and boosting your immunity. First, why is vitamin C so crucial? They help immune cells to mature, improve the performance of antibodies, they destroy toxins produced by bacteria, they are a natural anti-histamine and calm inflammation. A study conducted from the Department of Health at the University of Helsinki tested the effects of vitamin C or a placebo on the common cold. They found that supplementing with 1 gram (20 times the Recommended Daily Amount or RDA) had a protective effect and studies using less than this amount tend to not be so conclusive. Vitamin C in the form of ascorbic acid is best and the amount you will want to take ranges between 1000mg-3000mg. In order to find what range works for you, you can employ the bowel test. Excess vitamin C may cause bowel looseness which is not a sign of toxicity rather that is your personal threshold and stops when you reduce the amount you take. If you are interested in learning more about the protective effects vitamin C has for your health, there is so much great information and studies that have been conducted by Linus Pauling that you may want to check out. Food sources of vitamin C are also a great way to boost your immune system and although citrus is often considered the highest in vitamin C this is not really the case. Vegetables such as peppers, broccoli and brussels sprouts all contain a high amount of vitamin C. Because vitamin C is a very delicate vitamin that is damaged or destroyed by exposure to air, eating fresh foods as quickly as possible after you cut them is ideal. The four sigmatic hot cocoa recipe below will also help in this regard! Antioxidant power: Incorporating more antioxidants into your diet via supplementation and with your food choices is another great idea. The best antioxidants to include are Vitamin A, C (see above), E, and the minerals zinc and selenium. Vitamin A helps to maintain the integrity of the digestive tract, lungs and cell membranes which helps prevent foreign agents from entering the body and viruses from entering the cells. Vitamin A in the form of retinol (from animal sources) or beta carotene (plant sources) can be supplemented at a range of 5000-10,000 IU. Vitamin E improves both B and T-cell function and its immune boosting properties increase when it is given in conjunction with selenium. Vitamin E is a potent antioxidant that prevents diseases caused by free radical damage as well. For maintenance, you can supplement with between 200-800 IU in a mixed tocopherol form, with d-alpha tocopherol being the industry standard and the next best option. Zinc is critical for immune cell protection and proper functioning of B and T-cells and is beneficial during a viral infection more so than a bacterial one. Zinc citrate and chelate versions work well at a dose of 30-50 mg. Selenium protects the cell membranes as well as stimulates antibody production and one of the best food sources and my particular favourite is brazil nuts. If choosing to supplement with selenium a dose of 100-200 mcg is best for maintenance. You can find supplement formulas that contain all of these vitamins and minerals in one, such as an ACES +Zinc formula which is fantastic for your skin health as well (bonus!). Eating a nutrient rich diet: This is probably the easiest and in my opinion the tastiest way to boost your immune system naturally. Being the whole foods and food first nutritionist that I am, I fully believe that we can get so many of those important vitamins and minerals from food. The reason I suggested supplements and the dosages I did are for those looking to boost an already healthy diet in addition to those that really need to work on improving their immune system. The foods we eat today are just not the same as they used to be and soil degradation has led to less nutrients in the soil which means less nutrients in our food (even if buying organic!). This is why supplements offer a way to further guarantee our health and immunity, but DO NOT REPLACE A HEALTY DIET! Sorry for the caps, but it is important to note that popping supplements while eating a crappy diet will not equal optimal health. The two go together, hand-in-hand. So, eating a nutrient rich diet that includes all of the colours of the rainbow is so important in ensuring optimal health and thus a strong immune system. And making my four sigmatic hot cocoa or using other four sigmatic products is also a great idea! All info was derived from Patrick Holford, The Optimum Nutrition Bible. 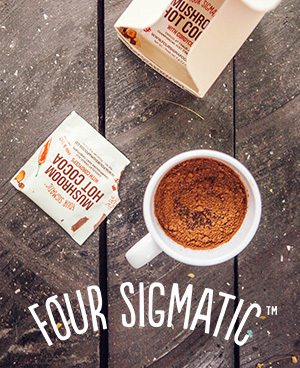 Now, how about a yummy four sigmatic hot cocoa that will help boost your immune system naturally and deliciously? I used Four Sigmatic Foods Chaga Mushroom Elixir for this drink and absolutely LOVED the taste and recommend using this brand specifically. I absolutely love all of their products and if you are curious to try or want to order your own with a discount, use my code holisticfoodie to save 10% off your order. If you want to use the drinking chocolate mix that I use (and I highly recommend it) you can purchase here. You can use the code HOLISTICFOODIE10 to save you money on this product if you buy through the Detox Market (Canada). A delicious way to boost your immune system! Make the hemp milk first if using by adding 3 tbsp hemp hearts to 3/4 cup water and blend. Then add all of the above ingredients to your blender. Pour into a small saucepan and heat on medium-low until heated and warm. Please note that the recommendations I provided are not intended to treat, diagnose or cure any illnesses or disease. Always speak with your doctor before beginning any supplemental program. The range I have provided is a guideline only. Hope you enjoy sipping on this four sigmatic hot cocoa and cheers to a healthy immune system!